WeBikeEugene – All the news that's fit to clean your chain with. 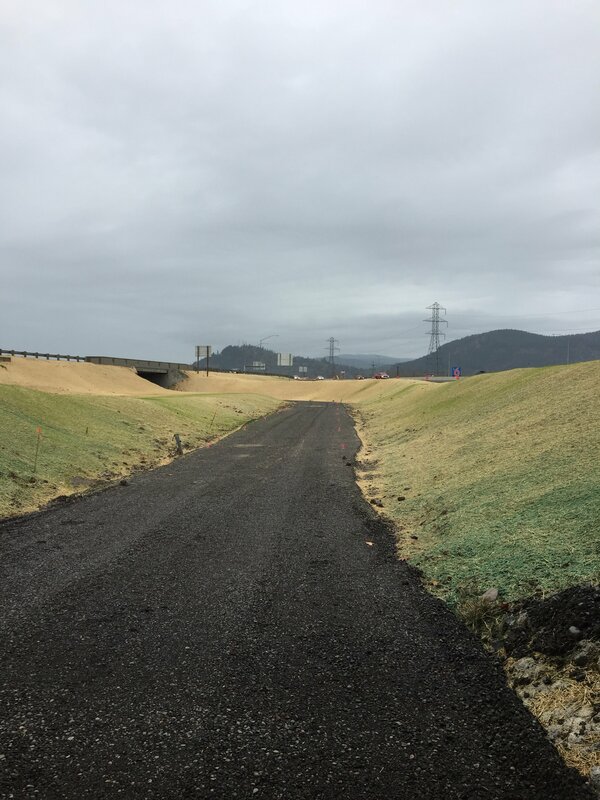 Completion of the multi-use path extensions along the west side of Interstate 5 have been delayed until next spring. Construction and weather delays led to the decision to wait until next spring to complete the path, which should result in an overall better result for users. The portion of the path that connects to Harlow Road will be repaved to allow users access to the path and eliminate the detour that has been in place for several weeks. That area is the future connection point for the southern extension of the path. North of Willakenzie Road, the path will extend to Old Coburg Road, next to the Eugene Register Guard building on Chad Drive. Travelers will go under Beltline and the nearby southbound I-5 off ramp. The footprint for the path was built in the last portion of the project. South of Harlow Road, the path will now lead to Garden Way, just north of I-105 West. A retaining wall has been built under the Harlow Road Bridge to allow room for the path. The entire path is now scheduled to be open in early summer 2018. The one major item on Eugene voter’s ballot this Fall was Measure 20-275, which was the third bond the city put forth to fund street repairs and improvements for people walking and biking. Over the next 5 years the rate of city investment from this pavement bond measure will increase from approximately $550,000 a year in the last bond to $1 million a year in the bond passed yesterday. Also, the roughly $50 million this measure will raise over five years will continue efforts to fix streets as they start to deteriorate before they are too far gone and are far more expensive to fix. During these repairs improvements are often made, separate from the dedicated pedestrian and bicycle funding, to make the street safer and more multi-modal. The Active Transportation Committee for the City of Eugene will be meeting tomorrow evening at the Atrium Building at 5:30 p.m. and one of the items on the agenda will be “project updates” where the initial discussion of what this bond measure could mean for active transportation projects in Eugene will be discussed, including what kind of matching funds these bond funds could be used towards to leverage even more improvements. In the last installment of this series on “Looking Towards 2021” we looked at active transportation projects that were completed over the last year. Now we’ll look towards projects that are on the schedule for 2018-2020. This coming year in particular has the potential to be a pretty big year for active transportation projects. We’re at a critical point in building out our bicycle and pedestrian transportation network and these projects are hopefully just the start of the kind of projects that will get more people choosing active transportation for more of their trips. Eugene Bike Share– It’s the biggest biking project that has come to Eugene in decades. It will bring 300 Social Bicycles to 35 stations throughout downtown, the university, and the Whiteaker. It has the potential to get more people on bikes more often and with that more people calling for better infrastructure. When combined with the 13th Avenue Cycle Track (see 2019 below) there is a great opportunity for an easy, safe, and convenient bike connection between downtown and campus. You can read more about the latest Eugene Bike Share news, including launch date and sponsor news, on our recent post about it. Amazon Active Transportation Corridor- This project has been in the works since the city applied for STIP-Enhance funding in 2012. The initial plan was to install the cycle track (two way separated bike lanes) on the park side of West Amazon. However that side of Amazon doesn’t have set back sidewalks like the East side does and so it would have placed the cars right at the curb and therefore right next to the pedestrian space. There are also more businesses to access on the East side and a better crossing of Hilyard and East Amazon. So in 2015 the city decided to change the facility to East Amazon. Best use of 36 feet of space. Sometimes it’s tough to keep up with all the transportation projects “in the pipeline” so I wanted to do an update on what projects were (or are being) completed this summer and fall, what is coming up in the next couple of years, and what projects could be priorities for the city to find funding for that will help us reach our transportation goals. I’ll be breaking those three sections out into different posts over the next several days. This first one will be about projects completed this year. The next post will be about projects coming up in 2018-2020. The final post will be about what we need to be working on to get us to our future goals. Those goals are laid out in the Transportation System Plan (TSP) that was adopted by the Eugene City Council on June 26, 2017 and it calls for a tripling of our active transportation mode share by 2035. So how are we going to get to that lofty goal? A good timeline some are using is 2021, as that is the year that Eugene will be hosting the 2021 IAFF World Track & Field Championships. It’s a pretty big deal for “Tracktown USA” as it is the first time the event has been held in the United States. The 2017 Championships were held in London and the 2019 Championships will be held in Doha, Qatar. With nearly 2,000 participants representing as many as 213 different countries from around the world it will be a time that Eugene will be on the world stage and it could be a great time to highlight how great our city is for healthy, active transportation. Jonathan Maus from BikePortland.org has been doing his “People on Bikes” series for years up in Portland and I’ve always liked flipping through them. The other day I was sitting down in Amazon Park while my kids played at the skate bowl and I decided to snap some photos of the 5 o’clock traffic. There’s an interesting mix in just these 30 photos that were taken in about a 15 minute window. Like BikePortland I’ll number the photos in case you want to give any ‘shout-outs’ or (friendly) comments. What things do you notice in this small sample? Unlike BP my photos are not very professional, but they get the idea across I think. I hope to do some more focused photos at another time. Have any good spots you’d recommend? Also, somewhat related, there is Sunday Streets ‘Afterparty’ with a Fall Bike Fashion Show AND a Tweed themed Moonlight Mash tonight so put on your nicest duds and come out to celebrate biking on this beautiful fall day. When Eugene received the grant for a bike share program back in 2015 the plan was to open by this Fall. Last week the City of Eugene, Social Bicycles, and other partner agencies, Lane Transit District (LTD) and the University of Oregon, announced that the launch date has been extended to the Spring of 2018. The move was approved by ODOT, the grant agency for the $909,000 ConnectOregon funding that is being used to purchase equipment for the project. 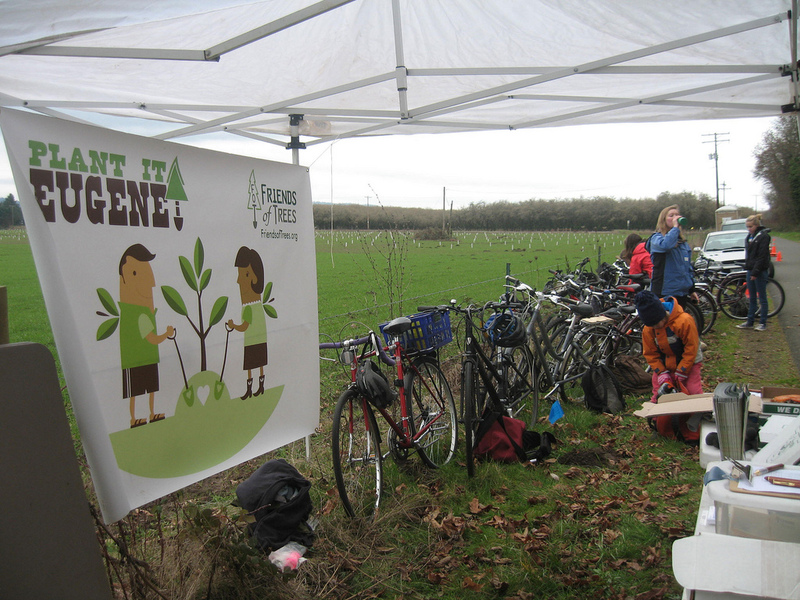 Last Spring the partner agencies announced Social Bicycles as the contractor who will run the Eugene project. Since then they have launched a EugeneBikeShare site, hired station siting coordinators, collected input on station locations, organized a community “sounding board” and earlier this summer hired Lindsey Hayward as the General Manager.